If you have ever wondered if Terry can run 41 here is the answer. I could watch that over and over....And over! Is that 36 mph??? I timed it three times, keep getting times much closer to 16.08 than 16.95. Awesome. That gate shot was sick! Insane skiing! How old is this vid? Just curious as the tug appears to be a 196. If (or when) he does that in a tournament, he may be the first to run 41 and jump 185 feet (or further; didn't he go 198 in the Nationals Night Jmp?). Anyone else in the running for that one? Looks like an HO Syndicate (A3?). @ Gloersen, I think that might have been one of the last model year S2's, black top, red bottom. That's awesome! I've been in the boat when he's run 41' off. It was on older SN with PP, but still cool as hell. S2. He always looked good on that ski. He got around [email protected] of the dock 3 times in a row at our place that summer. Ski with him if you ever get the chance. Easily my favorite skier to watch on vid. Would love to get some coaching from him. @twhisper you got the skills that kills! 1 ball was money! Wow!!.. Loved my S2. Still have my all time best score on that ski. I can't imagine how "on the edge" of disaster that must have felt. Determination is an understatement. Angle off every buoy was great and when it wasn't he adjusted it to be fully cross course by the centerline. The other aspect that stands out if you watch it slowly is even when he gets later around the balls the ski arcs wide and finishes the turn completely creating that angle. Need to watch it in slow-mo, otherwise I'm likely to spill my scotch. 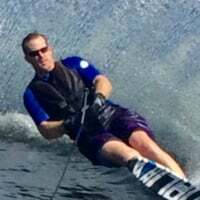 The biggest thing that sticks with me from watching and being coached by Terry last spring before my Achilles injuryis how much ski he keeps in the water all the time. It is very evident here and particularly apparent when I watch a video of myself. I try to think about stepping through the ski on the gate turn in and even when I do, it is nowhere close to the amount of ski he using. Can you post that in 1/4 speed so I can spend hours watching it! The definition of beast mode right there. Look it up in the dictionary and that video will be there. Wow-that is awesome. Real time is amazing. I have seen his slow mo many times.